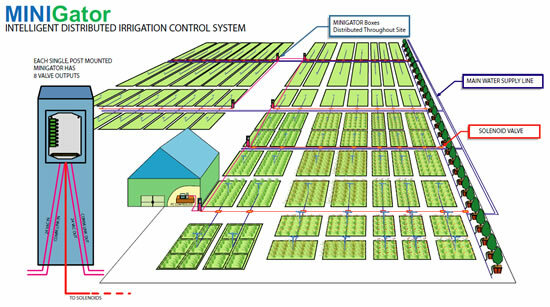 The QCOM MINIGator is part of the latest QLink range of controllers designed to operate under the GEMLink Greenhouse and Nursery Control system. The MINIGator features 8 individual irrigation valve output relays, each of which can be set to automatic control via GEMLink or manually on. The MINIGator connects to the GEMLink control system via a single RS485 communications cable. The MINIGator can be used to control all types of irrigation valves according to numerous start options available within GEMLink. 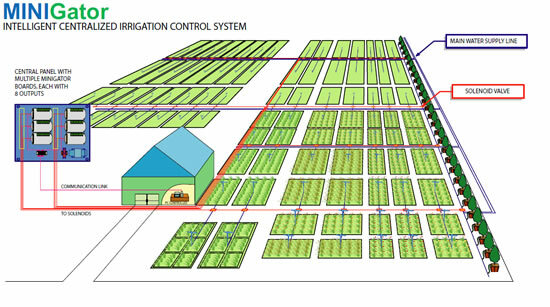 It is equally suited for greenhouse and nursery irrigation control. A 9th relay provides a pump start option which is activated when any of the 8 valve control relays are activated.